I work in the schools as a teaching artist, exploring Shakespeare plays, literature or original work by students–or hybrid combinations of texts. The basic idea is to experience literature and the written word out loud and on its feet! At Flood Brook Union School in Londonderry, VT, we are doing our 8th annual 3-week Eighth Grade Shakespeare residency–this year it’s our first Romeo and Juliet! We’re in our second year doing some intensive work on the same play with Green Mountain Memorial High in Chester, VT.
Over the last few years I’ve been conducting Young Playwright workshops in Vermont, with the Flynn Ctr/Weston Playhouse and the Middlebury Town Hall Theater. My AbNormal is an autobiographical play written by three young women from Addison County, about single motherhood in a pretty cold world (with Lindsay Pontius, Director of Education at the Town Hall Theater). 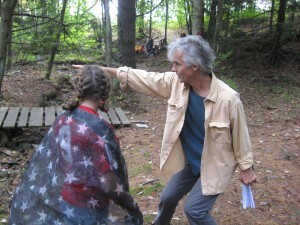 In 2012 we produced an original adaptation of The Phantom Tollbooth with the Sixth Grade at the Mettawee Community School in West Pawlet, Vermont, and the following year we did a similar project with The Evolution of Calpurnia Tate. I spent three years working at Berkshire Country Day Secondary School (2000-2003), with students who were inquisitive and great in every way. I wanted them to develop skills, to be onstage as continuously as possible and find out as much as they could about the world beyond their community. These three years gave me a laboratory setting in which I had more license to try new things than ever before, even in my own theater. I sometimes forgot that these were kids in school, and saw them more as company members. An anthology piece about what people think animals experience. The piece came from about fifty different sources including Saroyan, Kafka, Thurber, Poe, Lewis Carroll, science writers, Booth cartoons… The setting had an abstract feel to it, inspired in particular by the work of Romeo Castelucci. The nature of chance and extinction informed the structure of the piece. We captured ‘mistakes’ that occurred in rehearsal and used them to interrupt and continue the various through-lines, in order to give form to abstract principles that came up in the writings. A piece built from interviews conducted in the surrounding community. Questions included ‘What is your favorite animal story?’ ‘What’s the worst trouble you ever got into?’ and ‘How would you like to die?’ Each student learned intensive character-study techniques, working with the videotaped interviews. Monologues and scenes were woven together to create a tapestry of human experience that evoked a hundred different settings, all of which were created out of thin air – and about twenty folding chairs. Two plays, Twelfth Night and King Lear, are combined, to create the world of the Fool. The two realities converge, illuminating each one in the light of the other. This project was especially useful in that it offered each student a substantial role that called upon deep investigation of the play in question as well as a willingness to take the character elsewhere. In this case, students worked in groups to collaborate as writers of their own scenes. The scenes were site-specific, taking place along an outdoor route. This project gave the students responsibilities along the entire spectrum of play-making. It was also a way to put basic sensory exercises to work in the service of a definable result: the various scenes were linked by a relationship to the space. This was an ensemble project that took excerpts from three plays about wealth and poverty: The Fever, by Wallace Shawn, Scenes from American Life, by A.R. Gurney, and In the Blood, by Suzan-Lori Parks. The value of this piece came from staging the monologues from the Shawn piece, creating characters and settings that were totally unfamiliar to the students, and illuminating the material in the light of the other plays. The Gurney material, set against Parks’ piece, took on a much darker aspect than Gurney usually does. In this way the students saw the possibilities of playing the unspoken layers of dramatic material. This piece is composed of selections from the writings of Du Bois, the prolific scholar and Black activist who was a Great Barrington native, mixed with interview material about issues of race and politics gathered from members of the cast. The material was explored and staged in collaboration with Chuck Cooper, the Tony Award-winning actor who played the title role. In this piece, the students synthesized elements of each of the earlier projects: anthology, interview, community outreach, formal language, and physical improvisation that led to choreographed sequences. The play was produced in collaboration with the Berkshire Theatre Festival, the Massachusetts Foundation for the Humanities, as well as many other contributing groups and individuals.